I’m disappointed. The Sapphires, a drama of at least partial basis in fact, never really captured my full attention for more than a few minutes at a time. In total, there are 98 of them, but it felt longer and more of a waste of good talent than I’m willing to come to terms with. Australia, 1968. We are introduced to Gail (DEBORAH MAILMAN), Julie (JESSICA MAUBOY), Cynthia (MIRANDA TAPSELL), and Kay (SHARI SEBBINS). They’re Aboriginal, and sisters. Kay, light-skinned, was taken away from the family at a young age by the Australian government during what is known as the “Stolen Generations”. One day, in a hotel bar, Gail, Cynthia, and Julie perform in a talent competition headed up by Dave Lovelace (CHRIS O’DOWD), an Irish talent manager who lives out of his car. While the crowd, all white, dismisses the girls, Dave sees something in them, and soon they’re performing for American troops in Vietnam – with Kay. It’s from here where the movie spidered off in a lot of different directions – there were parts about past love, new love, revelations about talent vs. personal perception, war, and, of course, music. 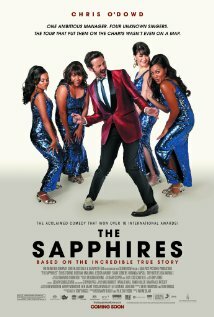 Arguably, the best thing about The Sapphires was the musical performances, which are mostly of and Motown-era soul hits. They are performed wonderfully absorbingly, and are a real treat to the viewer. The acting, especially from Mailman and O’Dowd, are very much sound. So what went wrong? The answer may be just about every other factor. The writing, based off a play written by the son of one of the subjects, is about ninety percent lackluster and uninvolving. Early on, locations and time periods are introduced through a CG map and stock footage. This idea could have been interesting and a nice quirk, but it’s abandoned very early in the film. Overall, these parts of the film and their mediocrity are so overwhelming that only a couple of scenes really end up all that memorable. The Sapphires was a movie that really had the potential to be good – great, even. It had a moving story, thoughtful characters, and great music. But a by the numbers execution killed almost every element except for a few standouts. This overrated and predictable drama even has the Biography Title Cards at the end! (Title cards over a black background explaining what happened to the subjects of the film after the events in the film, accompanied by a picture). I said it before: I am disappointed.